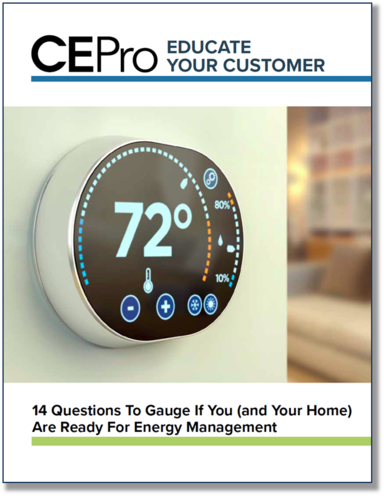 If your customers have been debating whether or not to make the investment in energy management, here's a free guide to help. Saving energy on utility bills shouldn’t be a sacrifice. It shouldn’t require customers to adopt a “green” lifestyle or live completely off the grid. Nor should they have to give up the creature comfort of home. Thankfully, energy management technologies and systems have made it possible to conserve without creating discomfort. There are a variety of smart home solutions that can help households run more efficiently and consume less power. Smart thermostats that adjust automatically based on the time of day and other conditions are a good place to start. From there, you can use motorized shades to prevent solar gain and a smart lighting system to keep your fixtures a dim, more energy efficient level. Saving energy isn’t hard if you have the right tools.